In true Sector 9 tradition, the Fiji Board has offered longboard riders yet another reason to rejoice. It is fair to say that this board is a game changer when it comes to cruising on a longboard. One of the standout features of this board is its weight. It weighs in at a light 7 pounds. This makes the board extremely easy to maneuver. It is an all-around skating marvel. Many of the things that make this board so nice to ride have to do with technological improvements we have seen over the past years in skating. This includes improvements in the urethane in the wheels and improvements in bearing quality. 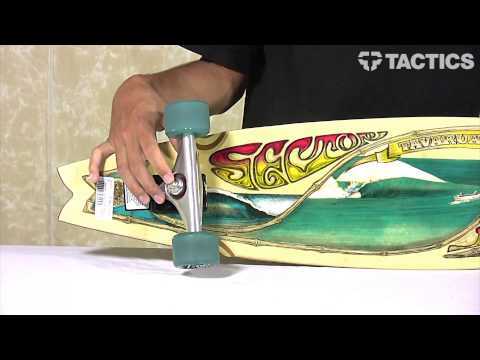 With this board, Sector 9 focused on improving a lot of the features that might have been lacking in some of their earlier products or that might not have been there at all. A good example of this can be seen when we look at the skating motion of the board. The skating motion of the board is regulated with exactitude. This is thanks to high-strength bearings that are being used. The bearings work with the board to enhance its stability. Users will notice this on any track that they test the board on. Experience riders know that it is impossible to enjoy a good ride if the board has low strength bearings. The Fiji Board is perfect for use on in connection with giant slalom carving. It has been designed with a mid-range wheelbase that lends itself to this style of carving. Additionally, riders have commented on how well the board performs while they weave in and out of outside bowls where shish kabobs were involved. This board is of such high-quality that it has been used by professional skaters. However, it is also perfect for showing new skaters the ropes on the board. One thing about this product that is going to be attractive to beginners is the price. It is a little bit cheaper than other boards that offer similar features. This is a great because it basically means that there is no chance that you are going to have buyer’s remorse. Maintenance on this board is a breeze. The vast majority of the maintenance that may need to be performed on this board can be done by the rider. For example, the bearings are extremely easy to lubricate and are widely available and affordable. Although the board itself is light, it can carry a heavy load. It is more durable than previous versions of the same board. Many customers have commented on how smooth of a ride the board provides. The only negative thing mentioned about this board is that it sits slightly higher off the ground than other similar style boards. This may take a little bit for a new rider to get used to, but the stability of the board and the smoothness of the ride makes this little con a minor consideration. It still remains the board to beat and the perfect tool for beginners.